Poetry New Zealand Yearbook 2 [Issue #50] (November 2015). ISSN 0114-5770. ii + 286 pp. Diana Brodie. Giotto’s Circle. ISBN 978-3-901993-41-1. University of Salzburg: Poetry Salzburg, 2013. Brentley Frazer. Kulturkampf: Selected Poems 1995-2015. ISBN 978-0-9941861-1-9. Brisbane: Bareknuckle Books, 2015. Vaughan Rapatahana. Atonement. Artworks by Pauline Canlas Wu; musical score by Darren Canlas Wu. ISBN 978-988-13115-1-1. Hong Kong: MCCM Creations for ASM/Flying Islands Books, 2015. 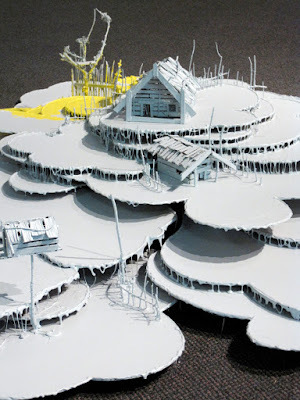 Maureen Sudlow. Antipodes. ISBN 978-1-927242-69-8. Wellington: Steele Roberts Aotearoa, 2014. Charles Brasch. Selected Poems. Chosen by Alan Roddick. ISBN 978-1-877578-05-2. Dunedin: Otago University Press, 2015. Miriam Barr. Bullet Hole Riddle. ISBN 978-1-927242-68-1. Wellington: Steele Roberts Aotearoa, 2014. Nina Powles. Girls of the Drift. 2014. ISBN 978-0-473-30843-8. Wellington: Seraph Press, 2015. Kerry Hines. Young Country. With Photographs by William Williams. ISBN 978-1-86940-823-7. Auckland: Auckland University Press, 2014. Jack Ross. A Clearer View of the Hinterland: Poems & Sequences 1981-2014. ISBN 978-0-473-29640-7. Wellington: HeadworX, 2014. Frankie McMillan. There Are No Horses in Heaven. ISBN 978-1-927145-67-8. Christchurch: Canterbury University Press, 2015. Stephanie Christie. The Facts of Light. deciBel Series 001. Ed. Pam Brown. ISBN 978-1-922181-28-2. Sydney: Vagabond Press, 2014. Anna Jackson. I, Clodia, and Other Portraits. ISBN 978-1-86940-820-6. Auckland: Auckland University Press, 2014. Mary Cresswell. Fish Stories. ISBN 978-1-927145-66-1. Christchurch: Canterbury University Press, 2015. David Eggleton. The Conch Trumpet. ISBN 978-1-877578-93-9. Dunedin: Otago University Press, 2015. A Place To Go On From: The Collected Poems of Iain Lonie. Edited by David Howard. ISBN 978-1-927322-01-7. 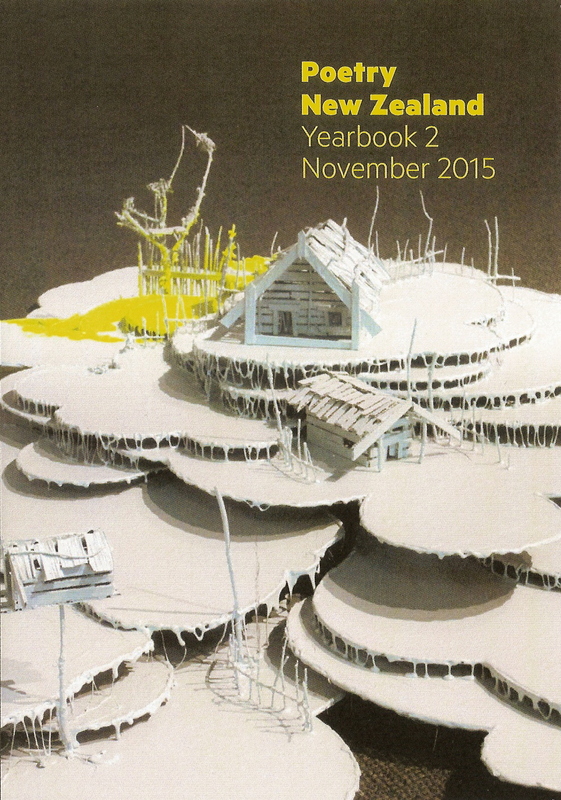 Dunedin: Otago University Press, 2015. Jane Summer. Erebus. ISBN 978-1-937420-90-1. Little Rock, Arkansas: Sibling Rivalry Press, 2014. Edward Jenner. 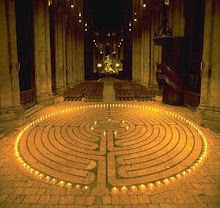 The Gold Leaves (being an account and translation from the Ancient Greek of the so-called ‘Orphic’ Gold Tablets). ISBN 978-0-9922453-7-5. 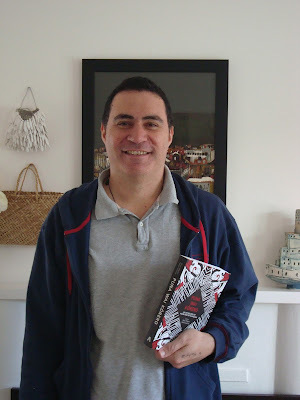 Pokeno: Atuanui Press, 2014. Diane Brown. Taking My Mother to the Opera. ISBN 978-1-927322-15-4. Dunedin: Otago University Press, 2015. Catalyst 11: My Republic. ISSN 1179-4003. Christchurch: The Republic of Oma Rāpeti Press, 2014. Martin Edmond & Maggie Hall. Histories of the Future. ISBN 978-1-877010-67-5. North Hobart, Tasmania: Walleah Press, 2015. JAAM 32: Shorelines. Ed. Sue Wootton. ISSN 1173-633X. Wellington: JAAM Collective, 2014. Julie Leibrich. A Little Book of Sonnets. ISBN 978-1-927242-29-2. Wellington: Steele Roberts Aotearoa, 2013. Emma Neale. Tender Machines. ISBN 978-1-927322-34-5. Dunedin: Otago University Press, 2015. Richard Reeve. Generation Kitchen. ISBN 978-1-877578-92-2. Dunedin: Otago University Press, 2015. Pat White. Fracking & Hawk. ISBN 978-0-473-32636-4. Aotearoa New Zealand: Frontiers Press, 2015. PNZ Year Book is excellent! A great cover design. Interesting interview with Robert Sullivan and his and your comments on Atua Wera, and his that Pound was an influence as well as Smithyman and his deep research, which lead him into writing Star Waka which I have read although I have to concede that, despite owning Atua Wera I have never got to read all of it ... another thing to do. But it does look good for sure. (And last year the interview with Lisa Samuels was also interesting and inspiring, I noted she was interested in Georges Bataille so I am reading some of his work now as a result - a bit late, and of course in my case in English translation. There are a lot of poems there and many very good. I read Geraet's essay / history of Brief which was good, and there are some other interesting things there: many in fact ... it is certainly a good production. 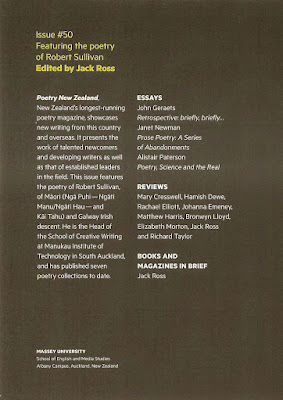 ... two journals I would recommend are Poetry London edited by Ahren Warner and Poetry New Zealand edited by Jack Ross. Both feature a nice balance of new poetry, essays and reviews, and are committed to featuring new as well as renowned poets. Ruth Arnison’s poem “Not Talking” in Poetry NZ Yearbook 2, November 2015 is one of the best, most heart-breaking, poems I have read all year. Dr Ross has signalled further changes to the publication, with the next issue to be published early in 2017 by Massey University Press - a new press launched in 2015 and headed by veteran publisher Nicola Legat. To shorten the length of time some contributors have had to wait for a decision, he’s decided to confine submissions to a three-month period: from May 1st to July 31st of each year, beginning in 2016. Zizi Sparks. "Poetry Editor's Diversity Call in New Edition." North Shore Times (February 4, 2016): 4. 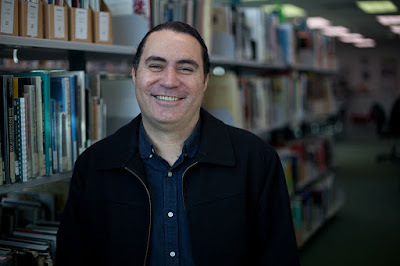 Maori and young voices are lacking in poetry, Poetry New Zealand editor Dr. Jack Ross says. The Massey University senior lecturer is sifting through hundreds of submissions for the magazine he's editing for the second time. He says in focusing on the multiculturalism of New Zealand, biculturalism has been forgotten. "I think everybody agrees that there's a lot of different cultures in New Zealand and traditions growing up." "But my feeling is that if we concentrate too much on that diversity we slightly lose sight of the fact that we're a bicultural country." He says Poetry New Zealand is a place for New Zealanders to have a voice. 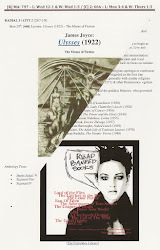 "When I was invited to the magazine I started thinking about what it means to have a magazine called Poetry New Zealand. 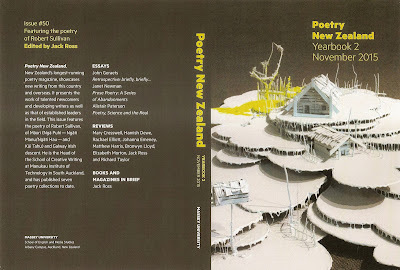 I thought how can one represent New Zealand poetry? ", he says. "It's important that there's a voice and I aspire to be representative but I can't create it myself and I can't ignore the other voices." 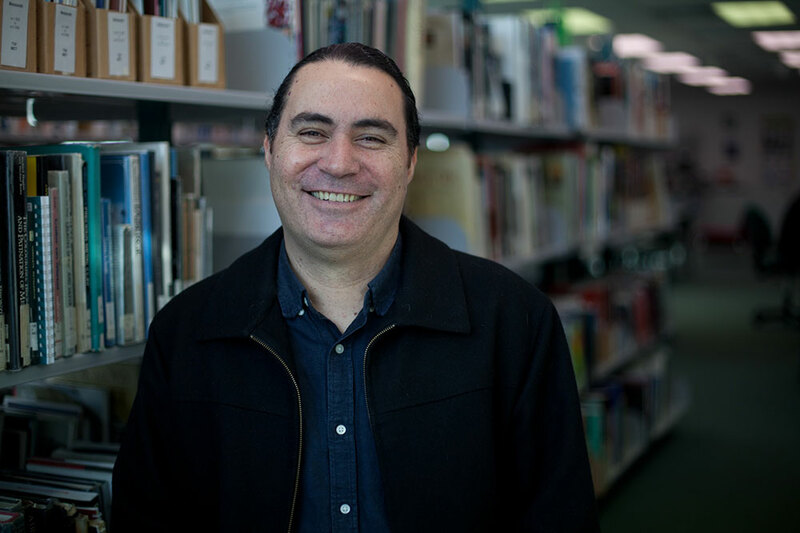 Ross wants to encourage young people and Maori to study or write poetry or literary arts. "If you want to study it, we're a good place to go but if you want to sit in your room and write, send it to Poetry New Zealand." The next issue of Poetry New Zealand will be published in 2017, and submissions will be open for three months starting May 1. The question ‘what is New Zealand poetry?’ is the overriding one for editor Dr Jack Ross, as he sifts through hundreds of submissions for Poetry New Zealand. His answer? – we need to hear more Māori voices. 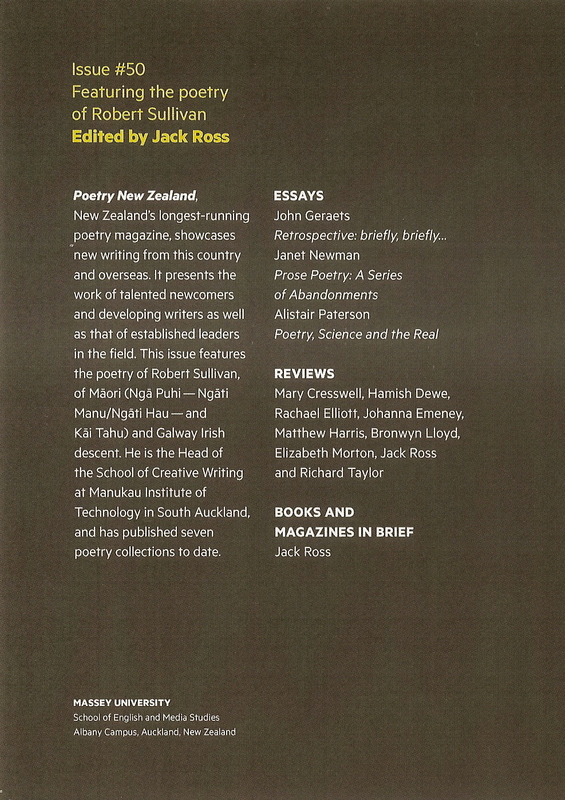 To remedy his observation that Māori poets have been overlooked in New Zealand publishing, he invited Māori poet Robert Sullivan to feature in the 50th issue – and Dr Ross’s second as managing editor – of Poetry New Zealand, the country’s longest-running poetry journal. The volume includes an insightful Q&A interview with the poet canvassing a range of issues such as biculturalism, poetry and identity. His ten new poems featured in Poetry New Zealand delve into childhood memories of growing up in Auckland, as well as tributes to his parents and grandparents. In his introductory editorial, Dr Ross makes the case for biculturalism as an underpinning element in defining New Zealand poetry. “For all its faults and omissions and blind spots, the Treaty remains the foundation of our state, and we can’t ignore the principles of biculturalism embodied in it,” he writes. He hopes more Māori poets will submit work in the future, in English and Te Reo Māori. 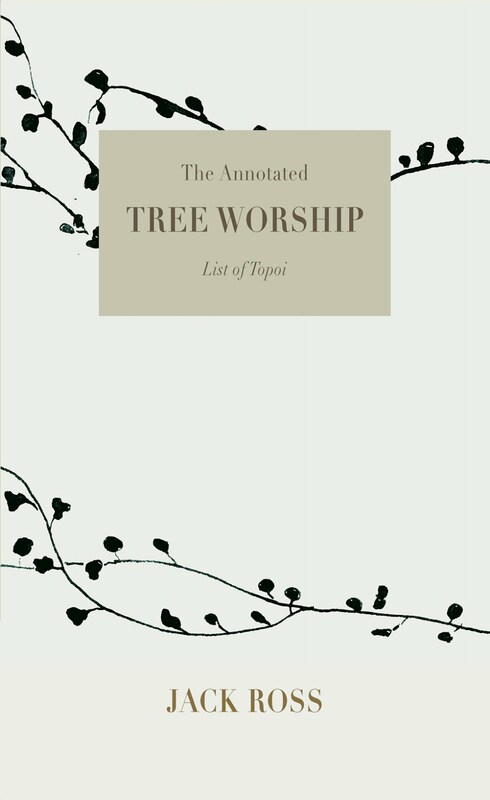 The 286-page volume, published last November by The Printery at Massey University, comprises poetry and prose poems by some 80 poets, including well-known names Elizabeth Smither, Owen Marshall, Peter Bland, Alistair Paterson, Siobhan Harvey and David Eggleton. 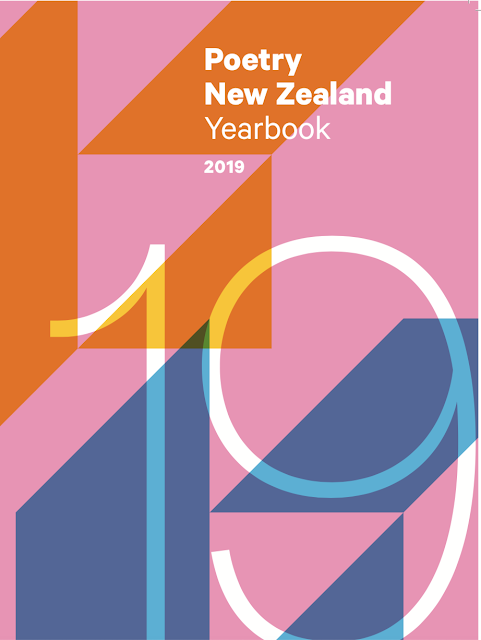 New Zealand poets based overseas and newcomers to New Zealand from diverse ethnic backgrounds are all part of the line-up, with a number of contributors either based in, or originating from, Bosnia, Canada, the United States, Scotland, Australia, and Japan. 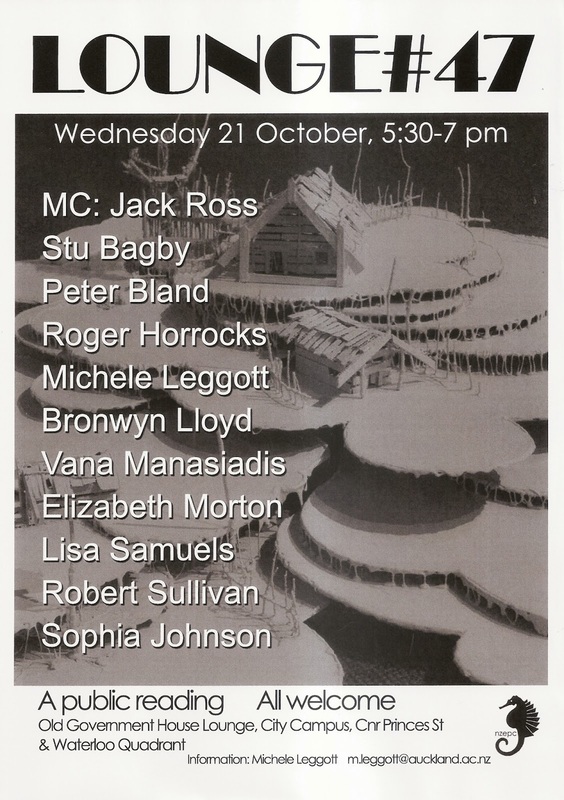 Massey University writers include award-winning poet and Master of Creative Writing graduates Sue Wootton and Janet Newman, and award-winning poet and PhD in Creative Writing graduate Dr Johanna Emeney, as well as creative writing tutors Dr Matthew Harris and Dr Bronwyn Lloyd, and lecturer Dr Bill Angus. Essays, commentary and reviews on new poetry publications by a host of local literary talents provide incisive explorations of some of the newest voices on the New Zealand poetry scene. Dr Ross has signalled further changes to the publication, with the next issue to be published early in 2017 by Massey University Press – a new press launched in 2015 and headed by veteran publisher Nicola Legat. And to shorten the length of time some contributors have had to wait for a decision, he’s decided to confine submissions to a three-month period: from May 1st to July 31st of each year, beginning in 2016. 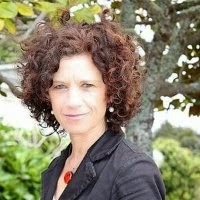 Dr Ross – a poet, editor and critic who teaches fiction, poetry, and travel writing in the School of English and Media Studies at Massey’s Auckland campus – in 2014 replaced distinguished poet, anthologist, fiction-writer, critic and retiring editor Alistair Paterson, who oversaw Poetry New Zealand for 21 years. The journal originated in 1951 when poet Louis Johnson began publishing his annual New Zealand Poetry Yearbook. Was there a stand out poem for Dr Ross? 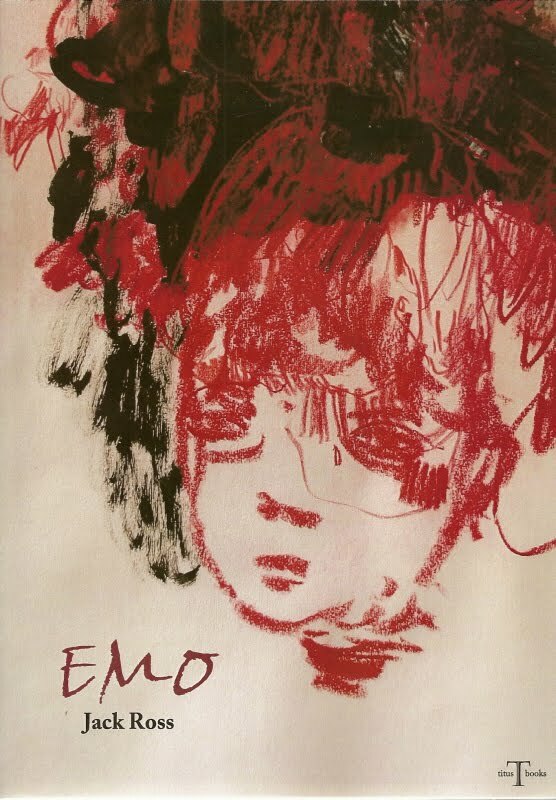 “It's hard to single out any one person from so stellar a list of contributors, but I found the two pieces sent me by young poet Emma Shi sounded to me like messages from a strange new country I'd never visited before. She is, I believe, a powerful new talent whom I hope to hear much more from in the future,” he says. To buy a copy, click here. 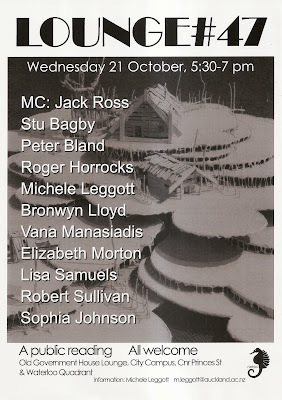 Read more on Dr Ross’s poetry blog or check the Poetry New Zealand Facebook page here. is easier, he says, to remember things that way. till i’m up to my heart with water. against seashells, forget how to breathe again. is the adult side. Grafton is where I was a child. The things I know now I wish I knew then! This sensory garden does invite the skin and ears. is like a big beer fridge. The sunlight and the starlight know this.